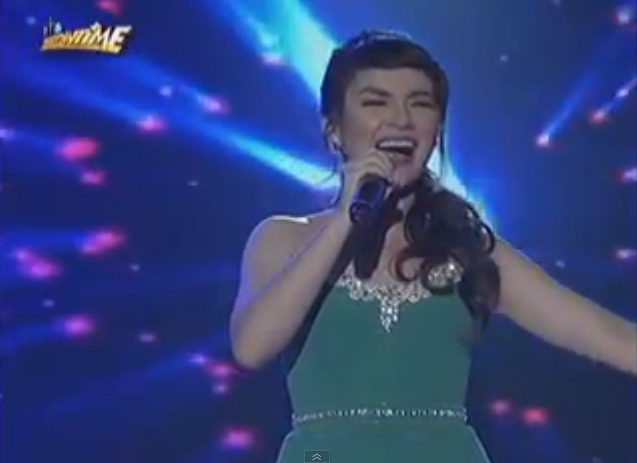 Gerphil Flores finally made her very first ABS-CBN guesting after placing 3rd on Asia's Got Talent 3 weeks ago. Gerphil performed 'Impossible Dream', the same song she performed during the AGT finale, and as she already did before, it was an emotional jaw-dropping performance that will give you goosebumps. Watch video! Now I'm beginning to love classical acts. Following her 2nd Runner Up finish in AGT, rumors swirled that Gerphil Geraldine Flores has ill-feelings toward ABS-CBN and is holding grudge against Kris Aquino and Ai-Ai delas Alas, who gave her negative comments when she joined Pilipinas Got Talent where she finished only as a semi-finalist. During ASAP 20's victory party for the Filipino grand finalists in Asia's Got Talent last May 17. The winner El Gamma Penumbra was there as well as Gwyneth Dorado and Junior New System, but not Gerphil Flores, who was seen a week later (May 24) performing a duet with Regine Velasquez in the rival show 'Sunday All Stars'. And so the rumors that she's snubbing ABS-CBN shows or she's never gonna guest on any Kapamilya program aren't true, when yesterday, May 27, she performed in the opening of 'It's Showtime'. This coming Sunday, May 31, Gerphil will be seen performing not on ASAP yet, but still on Sunday All Stars for the 2nd straight week, this time in a duet with Mark Bautista. Saan nararapat si Gerphil Flores?